When you make green tea, you grab a tea bag, a cup of hot water, and let the bag steep for a few minutes then toss it out and enjoy your tea, right? Did you know that the rest of what you’re throwing away in that tea bag is the part of green tea that provides all of the health benefits that are really good for you? Green tea can offer many health benefits including boosting your energy, supplying you with powerful antioxidants, possibly lowering your risk of cancer and weight loss. While green tea is a great option for you, matcha tea may be even greater. 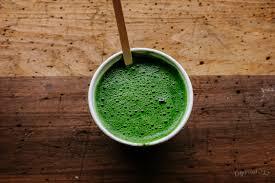 Matcha tea is green tea, essentially, but instead of putting the green tea leaves in individual bags, they are ground up in to a fine powder that you mix in with hot water. By grinding up the tea leaves and consuming them instead of just letting them soak in your water, you get even more of the benefits! Antioxidants – TIP: Antioxidants neutralize the free radical molecules in our bloodstream and they are naturally produced by the body, but it’s likely that they are outnumbered by the free radicals in our system, so it’s always a good idea to consume foods and drinks that contain antioxidants! Matcha tea can also be used in cooking! I know these health benefits sound too good to be true, but matcha truly is a great addition to your healthy nutrition habits! Ask your local grocer where to find matcha at your favorite store. It’s Go Thyme! This entry was posted in Uncategorized by Ellen Davis. Bookmark the permalink.